occurs. 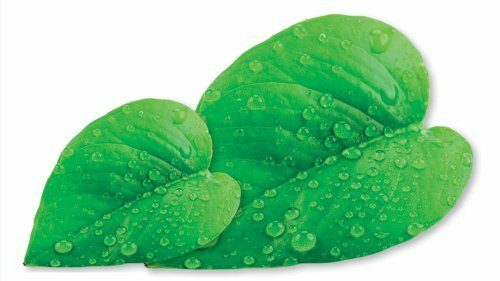 Negatively charged ions, which are generated inside the appliance, refresh the air and make the environment ideal for food preservation. The circulation of ionized air is provided thanks to the MultiFlow 360° system, with multi-point blowing through 14 ventilation inlets, which generates completely even temperatures on each shelf. 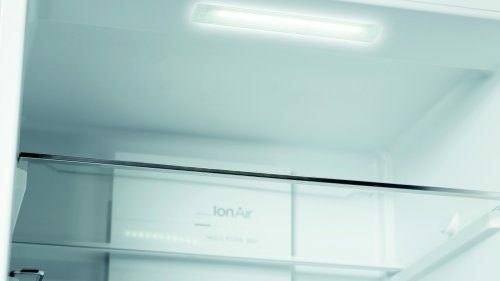 ION generation entry models feature the DynamicCooling advanced ventilation system. 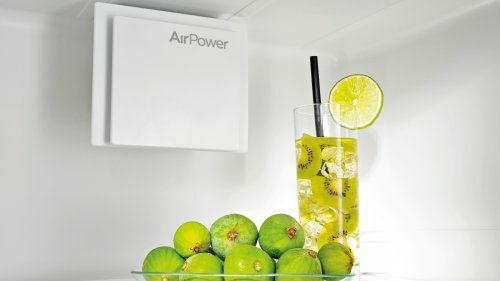 IonAir with MultiFlow 360° system purifies the air inside the refrigerator, keeping it extraordinarily fresh. Do you open your refrigerator frequently? Frequent door opening causes a sudden rise in temperature and food suffers from thermal shock, making it susceptible to spoilage. 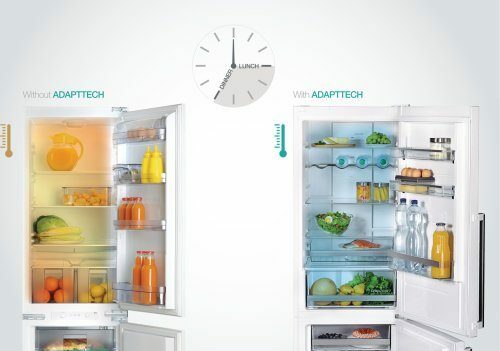 The ION generation of refrigerators deals with this problem by using revolutionary technology called AdaptTech. This system records how often the refrigerator door is opened in the last week of use. Once the system knows when door opening will be most frequent, it reduces the temperature by an additional 1-2˚C, just prior to this time period. Therefore, the ideal temperature remains constant and food spoilage is prevented. which offers much more than the standard NoFrost models, is called NoFrostPlus. FrostLess system, for 50% less manual defrosting. Modern NoFrost DualAdvance technology employed in the fridge-freezers extracts the humidity by intensive cool air circulation in order to prevent accumulation of frost on the food and ice in the freezer compartment interior. • the storage space is used more efficiently and the food is stored more neatly. 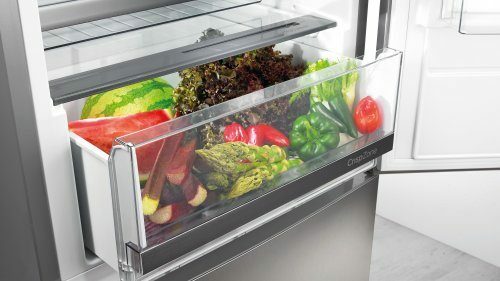 The refrigerator compartment on the other hand provides optimum conditions for storing fresh food since the cooling process for this part is fully separate from the one for the freezer compartment. • optimum level of humidity is provided in the refrigerator compartment, preventing the food from drying out and retaining its quality longer. One of the reasons for such high energy efficiency of Gorenje refrigerators from the ION generation is hidden inside the appliance. It is InverterCompressor, which adjusts its operation according to the precisely recorded temperature inside the refrigerator. When temperatures inside the refrigerator rise, cooling is automatically increased. Therefore, food heating and spoilage are prevented. The efficiency level is high, since the InverterCompressor reaches high-power operation much faster than conventional compressors. It also provides quiet, durable and stable operation. 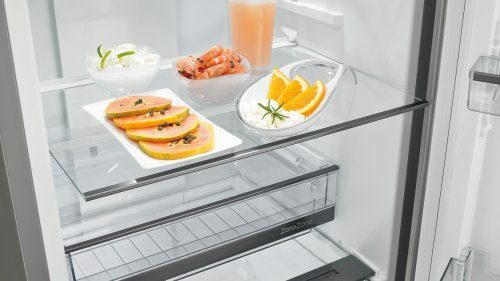 Gorenje ConvertActive refrigerator models, with a freezer compartment which converts into a refrigerator, come with a special feature called the CrispActive drawer. This drawer contains an LED light which helps in the photosynthesis process. It prolongs freshness even further and preserves vitamin C, essential for protecting the immune system and helping fight viruses. 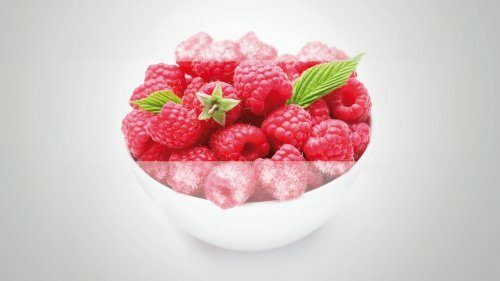 This feature helps slow down the ripening process that fresh fruits and vegetables go through naturally, preserving all the vitamins and minerals found in these foods. 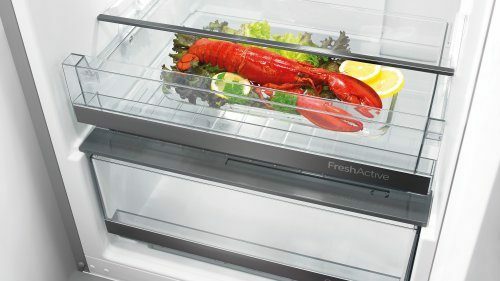 FreshActive drawer in ConvertActive fridge freezers is a perfect place for meat, fish and vegetables. 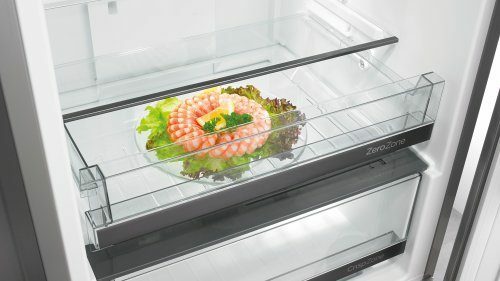 Its temperature is always lower than in the rest of the refrigerator, keeping the food extra fresh. Fresh fruits and vegetables spoil and rot more easily than other kinds of food. 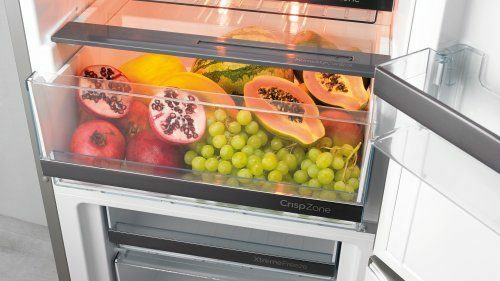 In addition to keeping all kinds of fruits and vegetables fresh, this spacious drawer with a 36 l volume gives you the option of setting the humidity level. By setting the HumiditySlider, you can simply adjust the level of moisture, therefore prolonging the lifespan of these foods additionally. Fresh meat, fish and seafood are the kinds of foods that must be handled with special care, especially during warmer months. 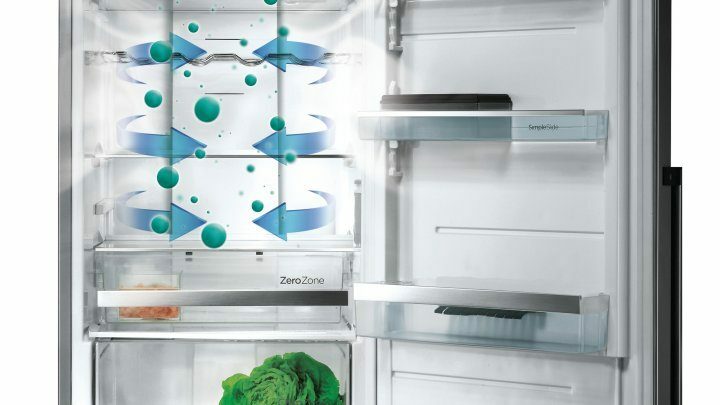 The ZeroZone drawer maintains a temperature of 0°C, prolonging the freshness of sensitive foods and maintaining their natural juiciness and nutritive value. This drawer is an ideal area to store meat or fish while it marinates for a couple of hours prior to being prepared. 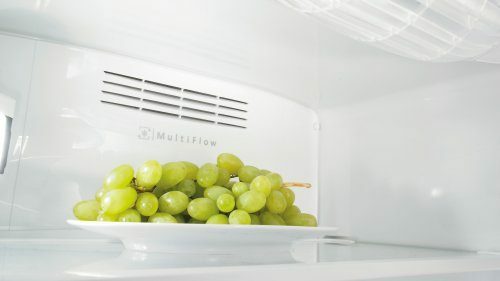 Our intensive regulatory system MultiFlow 360° actively balances air, humidity and temperature inside the refrigerator, making it the ideal environment for fresh food. Thanks to 14 ventilation inlets, an even temperature is maintained on each shelf, so there is no risk from food freezing anywhere in the fridge. 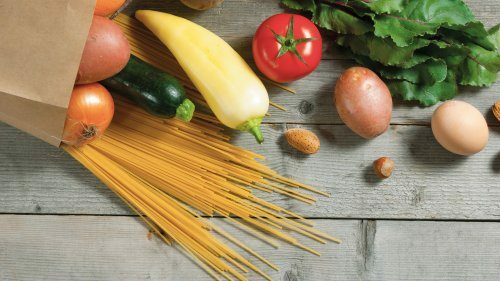 Constant and even temperature on each shelf is the best thing you can provide for your food, preventing drying out and maintaining its quality. This amazing regulatory system purifies the air and saves energy. There is a common misconception that frozen food is dry and unsavoury. However, when food is properly frozen, it maintains its nutritional value and remains very tasty as well. The secret is in fast freezing. 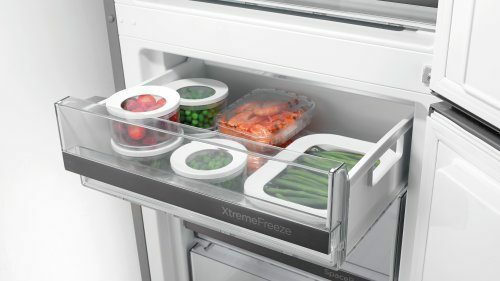 Premium models feature the XtremeFreeze drawer, which freezes foods 50% quicker than standard drawers, at the temperature of -30˚C. Entry models have the advanced, FastFreeze system. drawer, giving you even more space. Door shelves in ION generation fridge freezers can hold up to 5kg of food. Thanks to the SimpleSlide principle, it is very easy to move them up and down, according to your needs. This is especially suitable for tall bottles, which can easily get stuck between shelves. Arranging bottles and packages of all shapes and sizes is easy and fast. Therefore, the door is opened for a shorter period of time. This fantastic multifunctional box is located in the refrigerator door. 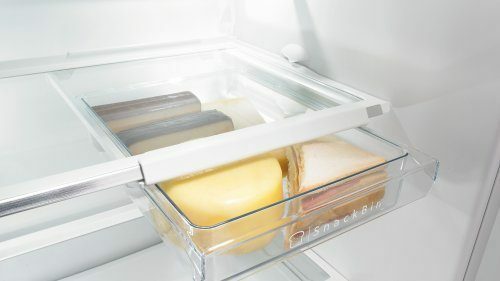 Since the negatively charged ions found throughout the refrigerator eliminate bacteria, this is an ideal place to store blue cheese and other foods with stronger odours. Additionally, the silicon lid can be used as an egg or ice tray. 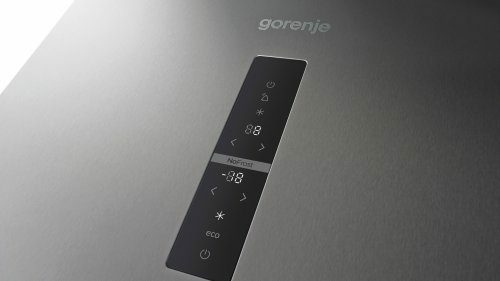 Led light in Gorenje’s ION generation refrigerators has two immense benefi ts – aesthetics and efficiency. Besides providing excellent lighting, it is remarkably efficient as well. Its lifespan is 3 times longer than regular light bulbs and it saves 10 times more energy. Function for faster freezing, perfect after major shopping. Excellent for freezing great quantities of food. 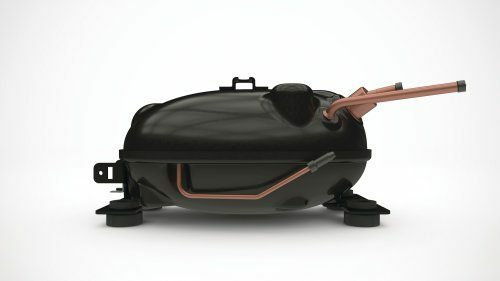 After activation, it lasts for 50 hours and maintains temperature at -24°C. More and more modern consumers find the SlotIn function compulsory. 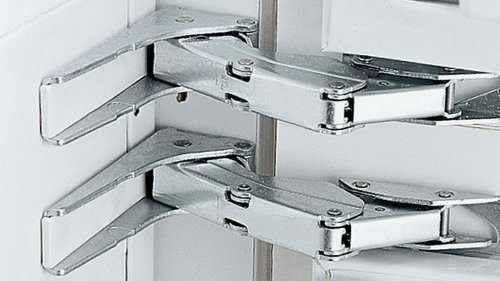 This solution is necessary if you need to place the refrigerator next to a wall, a counter or another appliance. Thanks to the SlotIn system, the door is easily opened at the right angle, even when the refrigerator is placed in one of these positions. 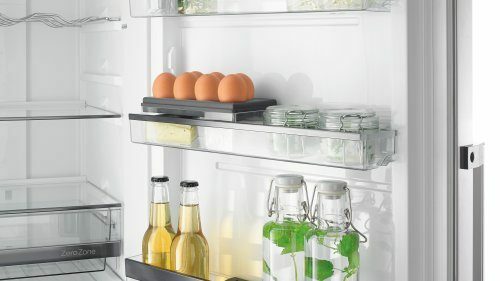 With sliding shelves, the entire contents of the refrigerator are quickly and easily accessible. 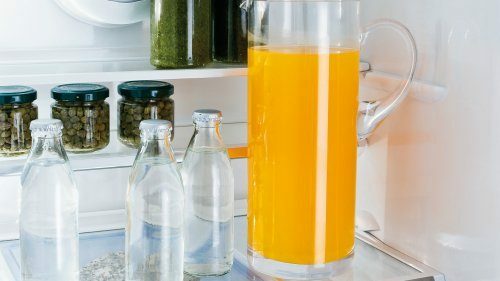 The contents of the refrigerator are more easily accessible, so that you no longer have to ‘delve into’ your refrigerator in order to access food located in the back. Shelves made from tempered glass are extremely durable and can hold up to 22 kg of weight. This smart technology significantly reduces the formation of ice inside the appliance, and makes manual defrosting rare and simple. 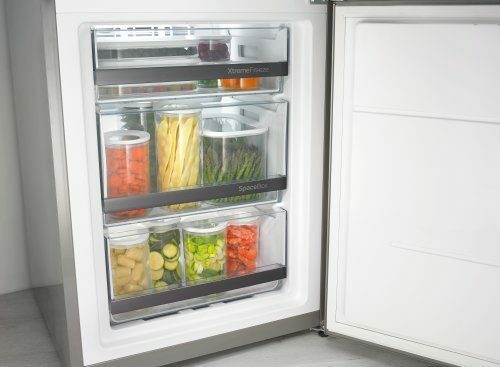 The hidden system inside the wall of the appliance reduces the accumulation of frost and ice inside the freezer. 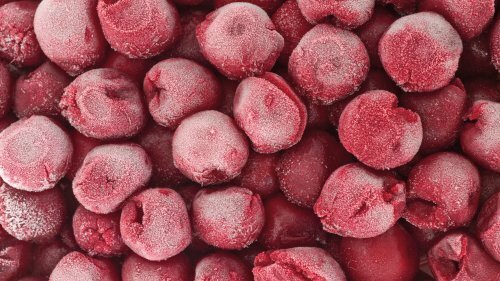 Besides reducing manual defrosting, FrostLess technology contributes to the overall energy efficiency. EcoMode provides significant energy savings when you are absent for longer periods of time. Since the refrigerator door is opened less frequently or not at all, this energy saving mode allows you to adjust your appliance to this situation, resulting in maximum energy savings. 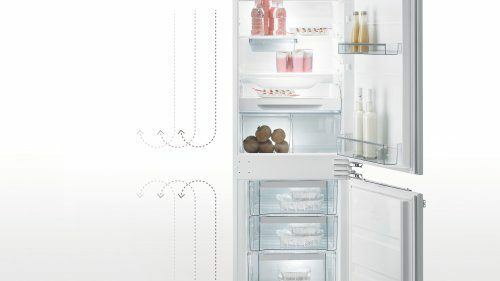 A special hinge design ensures a perfect integration of built-in fridges and freezers into your cabinets. By virtue of its extraordinary sturdiness it allows for a high load to be placed on the appliance door, and also enables the door to open at a wide angle of up to 115°. This makes it easier for you to check and access the contents as the door remains firmly in place during this time. Should you fail to close the appliance door all the way or leave it open at an angle of up to 45°, the hinge automatically pulls the door shut. This makes it easier to maintain the correct temperature in the fridge and helps you maximise your energy saving. 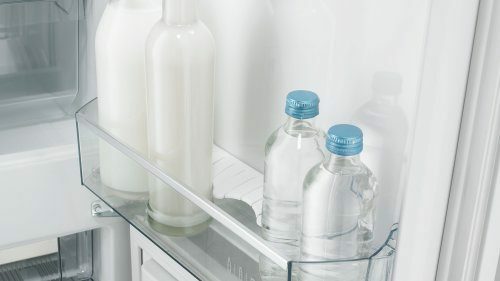 A split top shelf in selected models allows you to further optimise the available space in your fridge. The shelf can be used as an ordinary shelf or it can be divided into two smaller shelves, which can then be placed one under another. This way, you can create a space for storing taller containers or bottles. The deep door balcony for bottles is just the right size to accommodate large bottles, even up to 2.5 l. The balcony is fitted with a special safety device designed to hold bottles firmly in place when the door is being opened and shut. 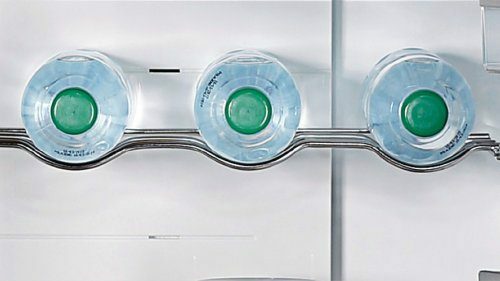 Specially designed wired BottleHolder provides a great way of storing different types of bottles and cans. 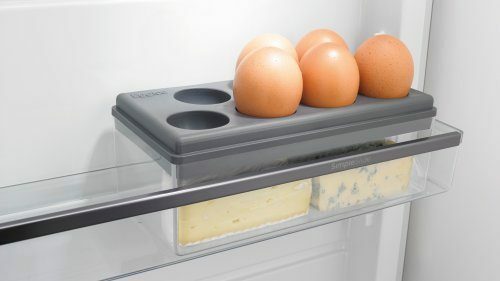 The holder can also be used as an extra shelf. To provide uniformly distributed temperature across the refrigerator, we have installed a fan into the appliance interior. The fan propels air circulation, thus improving the cooling performance. 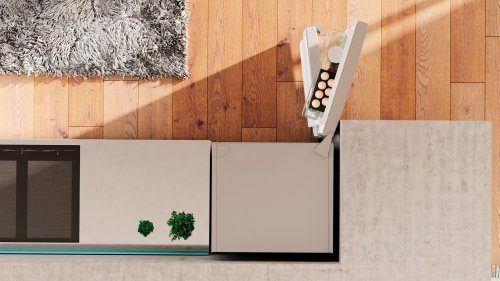 Such system will preserve the food and ready-made dishes for a longer period of time, regardless of which shelf the food is stored on. Furthermore, the fan prevents accumulation of dew or condensate on glass shelves and appliance interior walls. The SnackBin container provides an ideal place for the storage of foods such as cheese, salami, spreads, paté, sandwiches or butter. A tight container seal keeps the food safe and protects it from drying out. 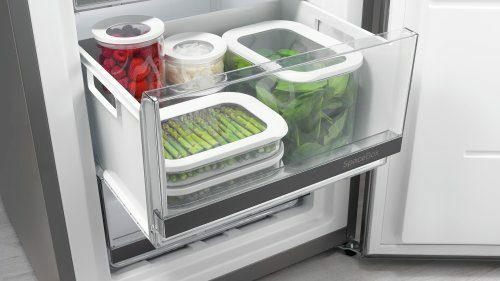 The SnackBincontainer is mounted on the bottom of the glass shelf in the fridge section, so it can be easily taken out and used as a serving dish. Container can be moved left or right in order to achieve even more adjustable interior. 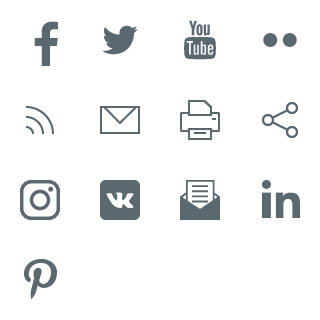 Electronic control allows accurate settings of cooling and freezing temperature and constant control over them, independently of the environment temperature. Advanced models also feature separate temperature regulation for the refrigerator and freezer compartment, as well as a LED temperature display. In addition to the core functionality, these models offer the FastFreeze freezer boost function and the SuperCool refrigerator boost function which will prove convenient after major shopping trips. A dedicated signal light, combined with an acoustic signal, will warn you of any increases in temperature in the appliance. Most models also offer the Eco power savings program. This way, the food will receive optimum care while you save power. Single compressor models with a valve boast a notable advantage over the traditional single compressor fridge-freezers: with such appliances, temperature settings in the refrigerator and freezer compartment are fully independent of each other. Hence, the refrigerator compartment can be powered off while the freezer compartment remains in normal operation. 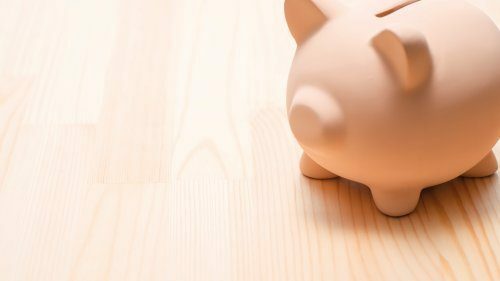 This will provide additional savings when you are away for a longer period of time, e.g. when you are on holiday.